UPDATE April 2017: Please note with the new option of the WIPAY payment method, E-Commerce in T&T will dramatically change in 2017. I’ll be re-writing this page soon. Everything you need to know about starting an online store in Trinidad & Tobago. The secrets finally revealed! There are over 400,000 Trinis online and all you need a a fraction of a fraction of it to have a humming online business that makes you money. Are you ready to be the first Trini truly ‘Amazon’ online store? If you don’t want to be all things to all Trinis and prefer to focus on what you know best, maybe fashion, electronics, computers, industrial supplies, auto parts, even dog food, then opportunities abound in the local online marketplace as there are little or no major players (with an emphasis on ‘no’). We’ve all shopped online on US sites so the mechanics of a shopping cart needs no explaining. The main thing is to understand the flow when you visit an online store yourself to make a purchase: You Log in/Create an account → browse → add to cart → proceed to checkout → pay. The rest is up to the merchant as all you did was create an order for him to fill, no different from phoning in the order and depositing the funds to his bank account. Magento is also a free open source CMS but specifically designed for E-Commerce in contrast with WordPress (which I use for business websites) that has the E-Commerce functionality plugged-in. As a Strategic Partner of First Atlantic Commerce (FAC) of Bermuda, FORWARD MULTIMEDIA offers their TT Dollar payment gateway via First Citizens Bank (FCB) from whom you need the Merchant Account. 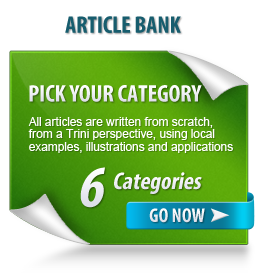 This gateway is specifically offered to Trinidad & Tobago so no workarounds are needed like with Paypal and 2Checkout. There is an application and evaluation process but both FCB and First Atlantic Commerce are very willing to work alongside T&T merchants who want to take the bold online step. Now is absolutely the best time to launch an online store in Trinidad & Tobago. One of the requirements of the gateway is the need for an SSL Certificate like Versign, GeoTrust and others. Since the payment processing takes place on a hosted payment page your site needs to be verified secure. FORWARD MULTIMEDIA prefers GeoTrust and the minimum accepted SSL is their Quick SSL Premium. Full details about the TT Dollar payment gateway can be found on the Payment Processing page. That’s it, easy as one, two, three…or is it? Not so fast, designing and development of a website takes careful planning and a substantial investment. If you’re inclined toward the Trini knack for ‘trying a ting’ then such a site either won’t work or won’t work for long. You don’t even need all 400,000 Trini’s to be your customers to be successful. The above are just the moving parts required to launch an online store in T&T. A Nissan Sunny has 4 wheels and an engine just like a BMW but they are easily distinguishable from each other. Your online storefront may well have the necessary moving parts but getting traffic and getting Trinis to buy from you requires a different set of moving parts and only FORWARD MULTIMEDIA’S special insights as well as Online Marketing Services will give you the edge! 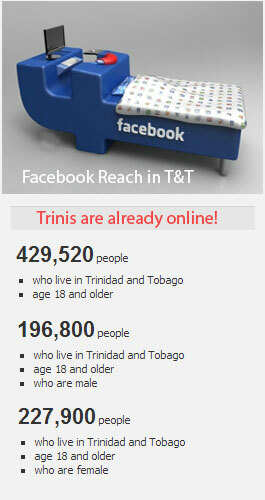 Trinis Eat & Sleep Facebook! The fact is that Trinis are already perfectly comfortable online and know their way around. 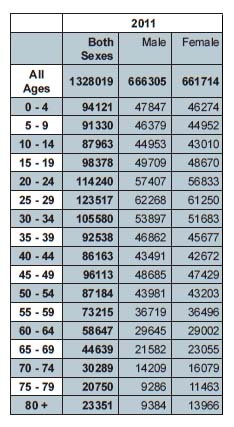 There’s a huge untapped market out there just for you. You just need a tiny percent of it to be profitable.